Over the past 10 years, the number of tourist and local people parking on Rt 23a from Palenville to Haines Falls has grown dramatically. Sometimes in the summer available parking spaces become almost impossible to find. Some visitors have resorted to abandoning their cars in the middle of the road, or leave part of their cars hanging out into the driving lane. This has led the Town of Hunter to move towards making the entire section marked as No Parking. The Town of Hunter has been meeting with NYS DOT, NYS DEC, and law enforcement to obtain a viable solution. The primary problem are kids who swim at Fawn's Leap and Dog's Hole. The kids have been leaving garbage in the clove and create enough problems that law enforcement and the DEC needs to dedicate large resources to handling the problems. Town of Hunter Supervior Daryl Legg is determined to find a solution. Part of the problem is that the kids have been driven away from other swimming holes in the Catskill Mountains. With a hot summer, the problem has gotten much worse. One swimming hole is the one in Devil's Kitchen. The access from the top of Devil's Kitchen is extremely dangerous and has resulted in two deaths two years ago. There is no place for the kids to park on the lower part of Devil's Kitchen. If there was a parking lot for the kids, this would alleviate the problem in Kaaterskill Clove. But, to achieve this goal, would require the DEC to put in a parking lot and path. This is unlikely to happen. There is also another problem by Bastion Falls. Many tourist come here to hike up the short path to Kaaterskill Falls. Right now there are too few parking spaces for the number of tourist visiting Kaaterskill Falls. Additionally, tourist resort to walking directly in the roadway from the parking lot to the trail head to Kaaterskill Falls. 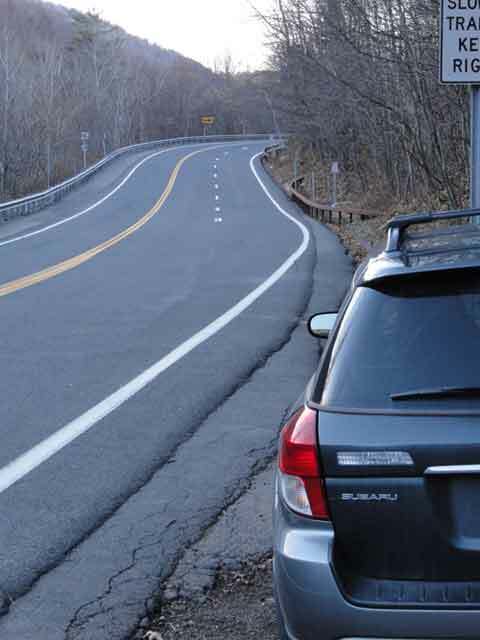 About 10 years ago when this section was rebuilt, the DOT wanted to put in a walkway for hikers, but the DEC refused to allow them to do this. This resulted in people walking in the roadway. It is only a matter of time before someone is killed. Hikers: They use the Kaaterskill Clove from a number of access points. Very few hikers use the lower sections of the Kaaterskill Clove. They tend to be very experienced hikers. The other group are tourist visiting Kaaterskill Falls. They cause problems from walking in the roadway. On this web site we have asked people to walk behind the guard rail, and this is helping, but not fixing the problem. Hunters: Hunters use the lower Kaaterskill Clove to hunt during hunting season. Kayakers: They use the Kaaterskill Creek during high water. They rarely cause problems. Ice Climbers: They use the Kaaterskill Clove on both the north and south rim. They use the clove mainly in January and February. They don't cause too many problems, and they are generally responsible group. Swimmers: They use the Kaaterskill Clove from June to August. They come in massive numbers. They cause a wide variety of problems. This is the group that is prompting changes to the roadway. 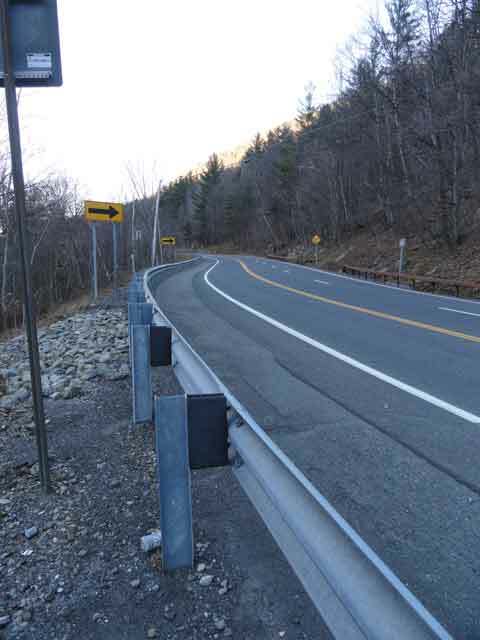 For years it has been proposed that the DOT and DEC put in a parking lot on the old Rip Van Winkle Roadway that runs along the Kaaterskill Creek from Moore's Bridge to Haines Falls. Between Lake Creek and Moore's Bridge it could hold several hundred cars. This would be the best long-term solution. It would cause a longer hike to Kaaterskill Clove and reduce the number of visitors. It would get all the cars off the road. It would also make it better for ice climber to access the many ravines for ice climbing. This solution would be expensive and would take a long time to implement. when we went up hunter last week we went up 23a and saw the DOT road signs that said anyone parking along side the road would be towed. At around 9 in the morning there was no one on the side of 23a and very few people by the parking lot at the top near the falls. By the time we were heading back down from the hike, people were parked illegally along the side basically from the falls to the lower bridge. It was ridiculous and very dangerous. There was one point when I was driving down that I had to stop completely because someone who was heading up saw there was space in between two cars which were illegally parked on the shoulder, and they were trying to parallel park there. The people behind them didn't like waiting for this person to park, so they just started heading around them and driving across the double yellow in the opposing lanes of traffic. I'm a very defensive driver and just stopped dead and waited for everyone behind them to get around, but I can see how situations like this can happen all the time, when people are impatient and rude and someone could wind up getting in head on collisions or worse, driving off the hundred foot fall to the creek. I couldn't believe how many people were parking just in drainage ditches and water runoff. Like they put extra blacktop down to guide the water off the road when it rains, and people park there. I think there should be no parking at all along that road, boo-hoo for swimmers. park at the bottom and walk up, or park at the top and hike down. If the parking lots are full, go somewhere else. If the hike/walk is too long don't go swimming there, go pay for day use at the North South lake campground which has huuuge parking lots. The water is just as cold and it's only like 6 bucks. Also judging from the license plates and the people we saw walking along the road it seemed mostly like out of town people, and out of state people, and college kids who are staying nearby in campgrounds or something. I can understand local people getting angry because they always use a certain waterhole, but that road should just be off limits for everyone until parking gets worked out. I think no-parking signs and ticketing and towing people is a great idea. This is exactly how most people feel about the situation. The congestion and stops have become unbearable. I think a large parking lot on the old Rip Van Winkle Road is the answer too. Just getting the State to do it is the problem. The strange thing is that Kaaterskill Falls isn't the highest waterfall in the Catskills, nor is it the highest waterfall in the Kaaterskill Clove. There are others that are higher. But, Kaaterskill falls is the most accessible. If they put the parking lot lower, people would have to hike longer and with more vertical climb. This would reduce the number of people going up to the falls everyday. Some people would just be happy to see lower buttermilk waterfalls. This would fix the problem around Bastion Falls. If they did pay-parking, then people would be more inclined to go to North-South Lake to go swimming. Some people don't like pay-parking, but it would fix some of the problems. The situation is pretty darn awful. A big parking area would be the best of all worlds. But, unlikely the DEC will ever agree to anything like this. I know that people have talked about it, but nothing ever seems to happen. When someone gets killed then everyone will be screaming that it should have been fixed years ago. Sounds like it is a bad situation that is going to be hard to solve. But, I have to agree that driving down Rt 23a is quite difficult.